VIPAccessEXCLUSIVE: Pop Your Shop, J.D. Luxe Mobile Truck, Emily And Lucy Jewelry, Glamifornia And More Got Attendees Festival Ready At The Pre-Coachella “Buchella” Event! Coachella, aka one of the biggest music festivals that everyone is talking about, is right around the corner. It’s time to get some major #inspo off of all of the incredibly chic, boho attires that attendees will be wearing to the three day festival. From amazing OOTDs to breathtakingly beautiful hairstyles, Coachella is the time of year we all have been waiting for. There are a lot of things to prep for as Coachella makes its way on over to the dessert. What are you going to wear? How are you going to style your hair? What kind of Coachella-inspired nail polish are you going to rock? Well, our friends at the pre-Coachella “Buchella” event totally had everyone covered. The outstanding event took place on April 7, 2018 at the Rosenthal Wine and Bar Patio in Malibu, California. Attendees were able to enjoy delicious wine while shopping for some items that will add some extra flair to their Coachella looks. With all of your trendy Coachella outfits, you’re going to need some fabulous accessories to go along with it. Your Coachella go-to should definitely be Emily and Lucy Jewelry. Emily and Lucy Jewelry has everything and more that you can ask for – from super cute chokers to terrific, long necklaces that are perfect to layer on top of one another. Emily and Lucy Jewelry has some magnificent, gold dipped feather pendants that will make you the best-dressed at Coachella. Other remarkable pieces to look out for from Emily and Lucy Jewelry include the Pave Hamas evil eye adjustable bracelets, the rose gold dagger earrings (which is definitely one of my faves from the jewelry collection), as well as some adorable, pineapple vermeil charm pendants. You seriously won’t be able to pick which piece of jewelry is your favorite. There are so many different styles and designs that are perfect for any and every outfit. In fact, Emily and Lucy Jewelry even has a brilliant collection of necklaces that has every zodiac constellation – this is definitely a must for everyone to buy. Whether you are treating yourself or giving it to a friend or family member, Emily and Lucy Jewelry is the greatest gift anyone could receive. It truly is a perfect accessory for Coachella, the summertime and everyday affairs. Glamifornia Style Lounge was also pampering attendees at the Buchella event. The salon, brought about by the wonderful Terah Tidy, is located in Malibu and it’s a place that leaves everyone on Cloud 9. Glamifornia offers everything from hair styling and coloring to makeovers, manicures and pedicures, brow shaping and more. Glamifornia will make you feel like the #QUEEN that you really are. Glamifornia truly stands out amongst all of the salons in Los Angeles. Where can you find a salon that not only pampers you but also offers awesome sessions including photo-shoots, perfumery classes, makeup tutorials, meditation guidance classes and more?! That’s right, the only place you can find all of that under one roof is at the sensational Glamifornia salon. Glamifornia had a stellar time giving Buchella attendees a fun, new ‘do at the event. Whether you wanted to try on a wig and go blonde… or blue or add some fierce hair extensions in, Glamifornia took beauty and fashion to a whole different level. I had a spectacular time getting two, pink hair extensions and one, black hair extension wrapped within my braid. It was a look I’ve never tried before and something that I instantly got obsessed with thanks to Terah Tidy and her marvelous eye for the greatest trends. 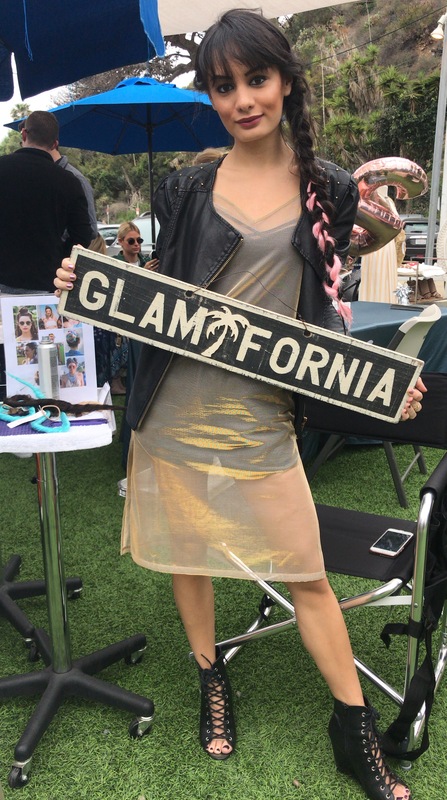 Glamifornia is definitely a place I would recommend for everyone to try out – there’s something there for everyone to enjoy and it’s a total beauty and fashion heaven! The fun continued with a dazzling, glitter bar from Chic Studios where attendees were able to get sparkly, temporary glitter tattoos. We all know that Coachella is all. about. the. glitter. so Chic Studios’ glitter bar was a perfect fit. Nail Garden also provided manicures for attendees to have them try out what color they think will make their Coachella outfits even bolder and brighter. J.D. Luxe also had a mobile boutique where Buchella guests were able to get their last minute festival shopping in and peruse through some stunning clothing items. J.D. Luxe will be having a brand new location opening up at the 3rd Street Promenade on May 1st so you need to come by and check it out. All this fun was brought about by the stupendous Pop Your Shop, founded by #BossBabe Harmonie Krieger. Pop Your Shop offers an unforgettable pop-up experience. The event had everyone up on their feet dancing along to music from the live DJ, snacking on some scrumptious food from excellent food trucks and there were even crystal infused perfumes from The Lyfestyle Co. and flower crowns from Cake & Punch at the event. The third year celebration of Buchella was a great success. I, Alexisjoyvipaccess had the most extraordinary time attending Buchella and it was a stellar event that truly got everyone pumped for Coachella and festival season as a whole. Comment below and tell me or tweet me at @alexisjoyvipacc, what are some of YOUR Coachella must-haves?! Follow @PopYourShop, @EmilyAndLucyJewelry, @Glamifornia, @JDLuxeFashion, @NailGarden, @RosenthalWines, @ChicStudios, @CakeAndPunch_, and @TheLyfestyleCo on Instagram to keep updated with all of your Coachella must-haves! Previous Article: Halsey Surprises The Cutest Sneaker Fan In A Brand New Episode Of Complex’s “Sneaker Shopping” – Watch Here! Thank you so much for the generous love after Buchella last week wearing our Easy Updo Extensions in Pink Sunset and Dark Brown. It means so much to me as the founder and creator launching this business. I wanted you to know we did post the pictures and added links from our site to your social media and your blog in hopes we can drive some traffic to you. You’re gorgeous and I hope we get to collaborate with you again in the future. Kind Regards and Take it Easy!